In the 89-year history of THE RING’s Fighter of the Year award, no boxer has ever earned the honor with as few fights under his belt as Vasyl Lomachenko has. Then again, few have achieved as much as the Ukrainian amateur star did after only 11 pro bouts. Two years and three title defenses later, he won his second world title in a second weight class, the WBO 130-pound belt, with a fifth-round KO of Roman Martinez. His first defense – an embarrassingly one-sided mastery of Nicholas Walters that forced the unbeaten former featherweight titleholder to pull a “No Mas” after seven rounds – was so impressive that he instantly jumped into the top half of most pound-for-pound lists by the end of 2016. So, what made Lomachenko’s 2017 so special? Why was he selected as THE RING’s Fighter of the Year over worthy candidates such as Terence Crawford, Anthony Joshua, Mikey Garcia and Srisaket Sor Rungvisai? For starters, he fought more than the other standouts in 2017 – three times – continuing to outclass and bewilder opposition to between-rounds retirements, but he also made large strides toward transitioning from a boxing-world phenom to the kind of general sports standout recognized by casual fans and mainstream media. 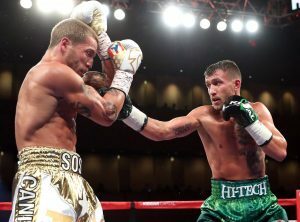 Lomachenko’s humiliating brand of dominance was expected against his first two opponents of 2017, Jason Sosa and Miguel Marriaga, both solid contenders that will give any other world-class featherweight or junior lightweight a grueling night. Lomachenko forced the battle-tested scrappers to remain on their stools after nine and seven rounds, respectively, and he didn’t mind showboating as he gradually picked them apart from every conceivable angle. 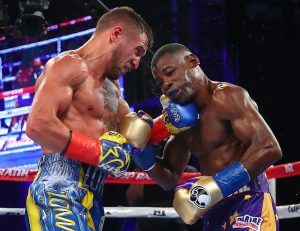 Although Lomachenko was favored to beat his third opponent of 2017, fellow two-time Olympic gold medalist Guillermo Rigondeaux, he wasn’t expected to have his way with the counter-punching master. Rigondeaux, who carried a 17-0 pro record into their anticipated showdown at The Theater inside Madison Square Garden, was the older of the two savvy left-handers (37 to 29) and moving up from the 122-pound division, but the Cuban also brought with him a style that many believed was impossible to dominate or look good against. Lomachenko did both en route to Rigondeaux’s inglorious retirement after six rounds. Lomachenko downplayed the victory during his post-fight interviews, basically stating that he did what he was supposed to do, but there can be no downplaying of his boxing ability or his rising stature in the sports world. Lomachenko appears to be on his way to becoming a bona-fide attraction. It was literally standing room only inside the 5,000-seat Theater (with no space for comps or auxiliary media and tickets rumored to be going for three times face value on the secondary market prior to the ESPN-televised card). Promoter Bob Arum says the two-division titleholder will fight at least three times next year, perhaps once in the “big room” of Madison Square Garden. Lomachenko is clearly done with small venues and fighting in front of limited TV audiences. Lomachenko-Rigondeaux was watched by 1.73 million on ESPN (twice the number of viewers that tuned into a UFC offering on FS1 that was broadcast during the same time slot). It was ESPN’s highest-rated show on December 9, exceeding viewers for the Heisman Trophy presentation and the MLS Cup. Lomachenko’s future fights will be televised on Top Rank’s new network partner, ESPN, which contributed to his crossover appeal in 2017 and will undoubtedly enhance his popularity in the U.S. in coming years. Lomachenko’s reputation has been established enough in 2017 that boxing geeks now argue how he would fare in a mythical matchup with a prime Floyd Mayweather Jr. at 130 pounds. However, Lomachenko isn’t interested in the future hall of famer, but rather one of the standouts of Mayweather Promotions, former IBF 130-pound beltholder Gervonta Davis. His “call out” to Davis, which was directed at Mayweather’s official Twitter account, attracted a lot of attention and eventually pulled Mikey Garcia into the social media conversation. Lomachenko eventually Tweeted a poll of four potential opponents – Miguel Berchelt, Garcia, Davis and Jorge Linares – which has garnered more than 40,000 votes. Garcia and Davis received the most votes, but if he can get any two of the four in the ring in 2018 he’ll likely be a strong candidate for back-to-back Fighter of the Year honors. 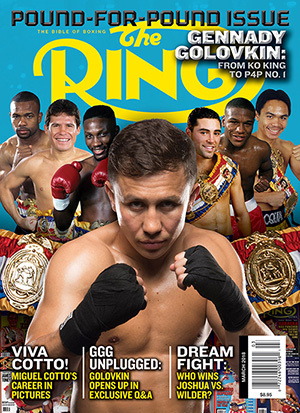 Following “Fighter of the Year” tradition, Vasyl Lomachenko will feature as cover star in the next issue of RING Magazine.